Featuring Richard Barrett on electronics and Han-earl Park on guitar. 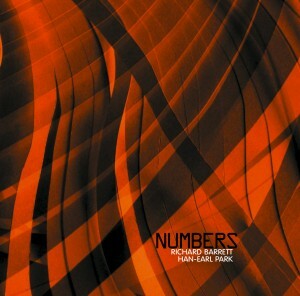 Richard Barrett is a UK composer as well as an improvising electronic musician who plays in Furt, Forch and with Evan Parker, all of whom record for the Psi label. Originally UK-based guitarist Han-earl Park has been living in NY for the past couple of years and working with many Downtown players like Louise Jensen & Michael Evans (who he played with here at DMG last Sunday – 1/20/13), Harris Eisenstadt, Tim Perkis and Anthony Braxton. When Mr. Park was living in the UK, he worked with Paul Dunmall, Charles Hayward and invented a device called io 0.0.1 Beta, that played its own improvisations. An impressive resume for sure. Han-earl left us with this duo effort and I’m glad he did. I dig the intense exchange between these two gifted improvisers. There are a number of bent sounds which make it hard to determine who is doing what. What electric guitar sounds I recognize are sharp, focused and quickly formed & let loose. Han-earl does not sound like a jazz guitarist and doesn’t play any of those popular licks. More often he is playing a series of broken yet tight phrases which fit perfectly with Mr. Barrett’s more rounded electronics. The fractured phrases that erupt throughout this disc often sound like just one musician playing by himself since we never know where one sound begins or ends or what it will turn into. There are a few rubbed string sounds which remind me of Fred Frith at times but that is the reference I can pull out of my own listening encounters. Otherwise this is duo is completely unique, exciting and engaging. You can get the CD from DMG for a limited time price of $14 (normally $16)! btw, I have yet to perform with Mr. Braxton (I assume Bruce meant Wadada), and I’m from California, but otherwise the description, especially “fractured phrases that erupt throughout this disc often sound like just one musician playing by himself since we never know where one sound begins or ends or what it will turn into”, is pretty accurate! Thanks for listening, Bruce. Harris Eisenstadt, Han-earl Park and Tim Perkis (The Stone, NYC, September 7, 2012). Photo © 2012 Tom Djll. Big thanks to all the performers over the weekend: Harris Eisenstadt, Michael Evans (drums), Louise Dam Eckardt Jensen, and, especially for the initial invite to perform at The Stone, to Tim Perkis, one of the very finest computer performers, and one of the few who understands the nuts’n’bolts of musicianship and performance. Thanks also to Miguel Frasconi for curating the series at The Stone, and to Josh Sinton and Prom Night Records for putting together Save The Date #8 at the Douglass Street Music Collective; and to Kevin Reilly and Don Mount for the documentation. And, nothing to do with my own performances, but I want to mention Tom Djll who, with Andrew Drury (thanks for the transport back home, Andrew!) and Tim, presented borderline genius deconstructions—diabolical combinations of intelligent critique and humorous pastiche—that followed our set at The Stone. This Friday (September 7, 2012), at 8:00pm: a performance by Tim Perkis (electronics), Han-earl Park (guitar) and Harris Eisenstadt (percussion) takes place at The Stone (16 Avenue C, New York, NY 10009). Admission: $10 (students 13–19: $5; children <12: free). 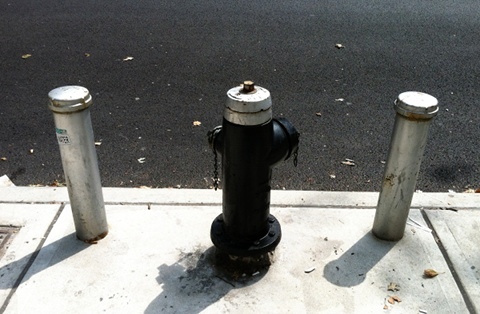 Friday, September 7, 2012, at 8:00pm: a performance by Tim Perkis (electronics), Han-earl Park (guitar) and Harris Eisenstadt (percussion) takes place at The Stone (16 Avenue C, New York, NY 10009). Admission: $10 (students 13–19: $5; children <12: free). Brooklyn, NY 11215 8:30pm Performance by Eris 136199 (Nick Didkovsky: guitar; Han-earl Park: guitar; and Catherine Sikora: saxophones), plus Christine Bard (drums, percussion and electronics), Bill McCrossen (bass) and Mercedes Figueras (saxophones), presented by On The Way Out. New York, NY 10009 8:00pm Performance by Tim Perkis (electronics), Han-earl Park (guitar) and Harris Eisenstadt (percussion). Admission: $10 (students 13–19: $5; children <12: free). Brooklyn, NY 11217 8:00pm Performance by Michael Evans (drums), Louise Dam Eckardt Jensen (saxophone) and Han-earl Park (guitar), plus Brad Henkel (trumpet), and Angelika Niescer Quartet (Angelika Niescer: alto sax; Florian Weber: piano; Chris Tordini: bass; and Tommy Crane: drums) presented as part of Save The Date #8.
late 2012 North America Numbers (Richard Barrett: electronics; and Han-earl Park: guitar) is seeking performance opportunities in North America, late 2012. Interested promoters, venues and sponsors, please get in touch! Brooklyn, NY 11225 8:00pm (doors: 7:00pm) Han-earl Park (guitar) and Josh Sinton (saxophone and clarinet), plus Anna Webber and Mariel Berger, and Natura Morta (F.L., Sean Ali and Carlo Costa). Brooklyn, NY 7:00pm Soup and Sound House Concert #12 with Jack Wright (saxophones), Ben Wright (bass), Andrew Drury (drums) and Han-earl Park (guitar). Brooklyn, NY 11215 8:30pm Performance by Nick Didkovsky (guitar), Han-earl Park (guitar) and Catherine Sikora (saxophones), plus Christine Bard (drums, percussion and electronics), Bill McCrossen (bass) and Mercedes Figueras (saxophones), presented by On The Way Out. New York, NY 10002 6:00pm Performance by Nick Didkovsky (guitar), Han-earl Park (guitar) and Catherine Sikora (saxophones) presented by COMA: Citizens Ontological Music Agenda.Also performing: Jim Goodin, Frederika Kreier, and the Rocco John Iacovone ensemble.Admission: $5. Brooklyn, NY 7:00pm Soup and Sound House Concert #11 with Andrew Drury (drums) and Han-earl Park (guitar), plus Bow Duo (Adrian Knight and Chris Cerrone). Brooklyn, NY 11215 8:30pm Performance by Nick Didkovsky (guitar), Han-earl Park (guitar) and Catherine Sikora (saxophones) presented by On The Way Out. Scarborough, England 7:30pm Performance by Numbers (Richard Barrett: electronics; and Han-earl Park: guitar). (doors: 8:30pm) Performance by Mark Hanslip (saxophone), Dominic Lash (double bass), Phillip Marks (drums) and Han-earl Park (guitar) presented by Jazz @ The Oxford. Brooklyn, NY 11215 8:30pm Performance presented by On The Way Out. Brooklyn, NY 11217 8:30pm Gowanus Company IV with Michael Bates, Matt Bauder, Ken Filiano, Brad Henkel, Ingrid Laubrock, Weston Minissali, Han-earl Park, Josh Sinton, Vinnie Sperrazza, Jesse Stacken, Booker Stardrum and “secret, special guests”. New York, NY 10002 7:00pm Performance by Nick Didkovsky (guitar), Han-earl Park (guitar) and Catherine Sikora (saxophones) presented by COMA: Citizens Ontological Music Agenda. 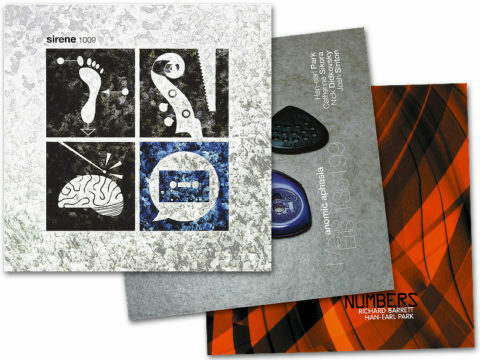 Scarborough, England 7:30pm (TBC) Performance by Numbers (Richard Barrett: electronics; and Han-earl Park: guitar). New York, NY 10002 7:00pm Performance presented by COMA: Citizens Ontological Music Agenda. New York, NY 10009 8:00pm Performance by Tim Perkis (electronics), Harris Eisenstadt (drums) and Han-earl Park (guitar). April–May 2012 Europe More dates TBC, but some dates still open: Mathilde 253 (Charles Hayward: drums, percussion and melodica; Han-earl Park: guitar; and Ian Smith: trumpet and flugelhorn), plus Numbers (Richard Barrett: electronics; and Han-earl Park: guitar) are seeking performance opportunities in Europe, April to May 2012. In addition, Han-earl Park (guitar) is available for formal or ad-hoc performances. Thomas Buckner (voice), Jennifer Choi, Wendy Law (strings), Casey Anderson, Casey Butler, Jamie Baum, Marty Ehrlich, Sara Schoenbeck, J. D. Parran, Jason Mears (winds), Ted Daniel, Taylor Ho Bynum, Mark Taylor (brass), Yuko Fujiyama (piano), John Lindberg (bass), Han-earl Park (guitar), and Bobby Naughton, Susie Ibarra, Martin Obeng, Harris Eisenstadt (percussion). Was great to catch up with some old acquaintances, and meet many new people. Some things to take away: the trio of drummers to my right (Susie, Martin and Harris) always sounded fantastic; Mark’s fluttering, playful solo was a highlight; Angelica Sanchez for her sense of humor; musing with Jason about the possibilities (and practicalities) of large ensemble creative music; and Yuko and Taylor making the sections breaks clearer for the rest of us. 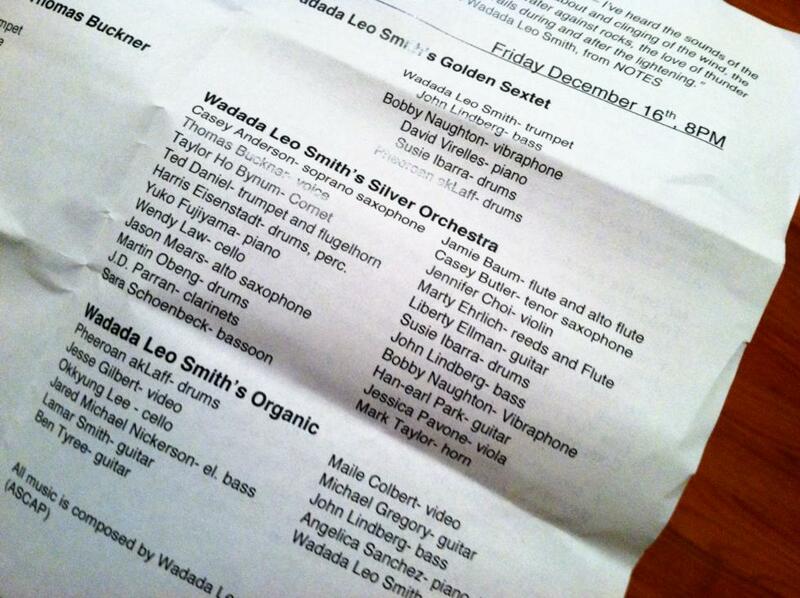 And of course, thanks to Wadada for taking time to guide us through his compositions; always a pleasure. 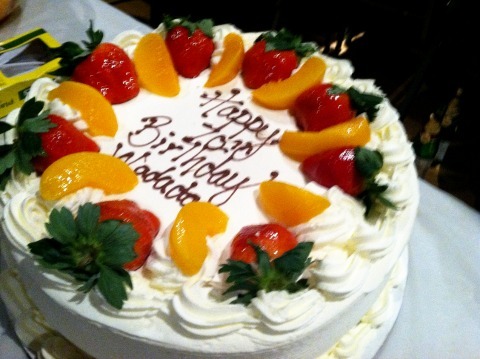 Happy Birthday, Wadada!